Celebrate the half-way mark of summer reading with a mini-food truck roundup in our Downtown parking lot. 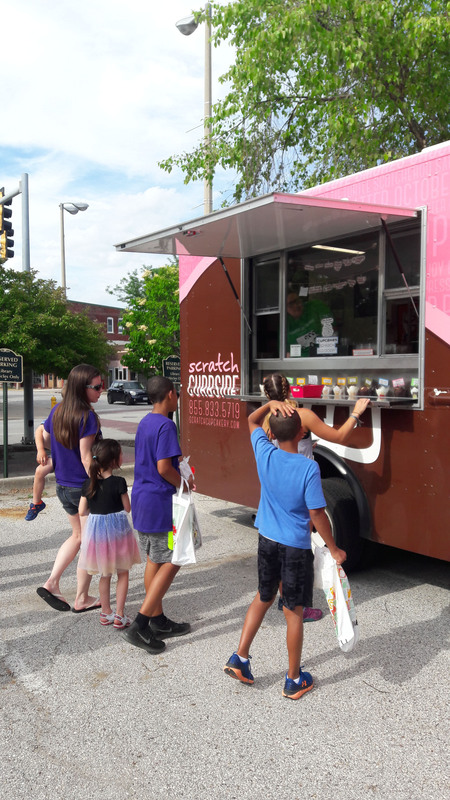 Joining us is The Scratch Cupcakery Curbside Van, the Cool Beanz Mobile Coffee Coach, and the Vibrant Credit Union ice cream truck. Purchase delicious cupcakes from the Scratch menu of specialty flavors and maybe a coffee/tea drink to go with them from Cool Beanz. A portion of proceeds benefit the library. Vibrant will be offering FREE ice cream, too! For family fun, chalk your place in the universe of readers (weather permitting,) take a shooting stars picture, make stickers and buttons, and check out some of the great ways you can take your stories "on the go" with your Rock Island Library card. Food trucks are rain or shine, other activities may move inside if rain.